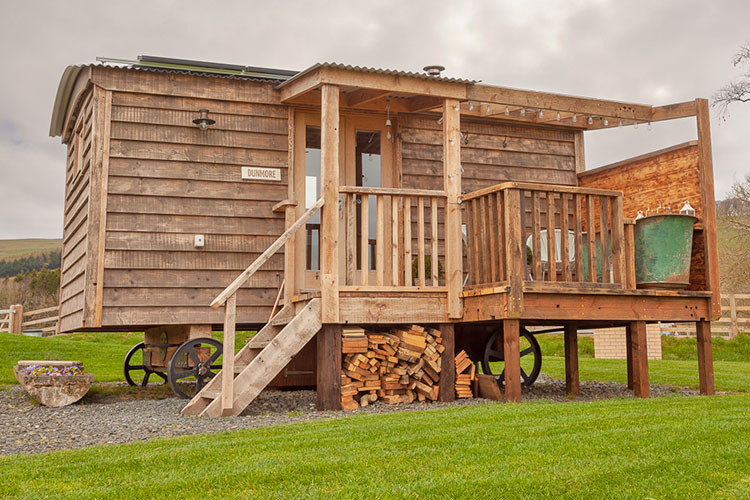 Each of our huts have been hand crafted in a unique style to the highest of specifications to provide the most comfortable and relaxing stay. 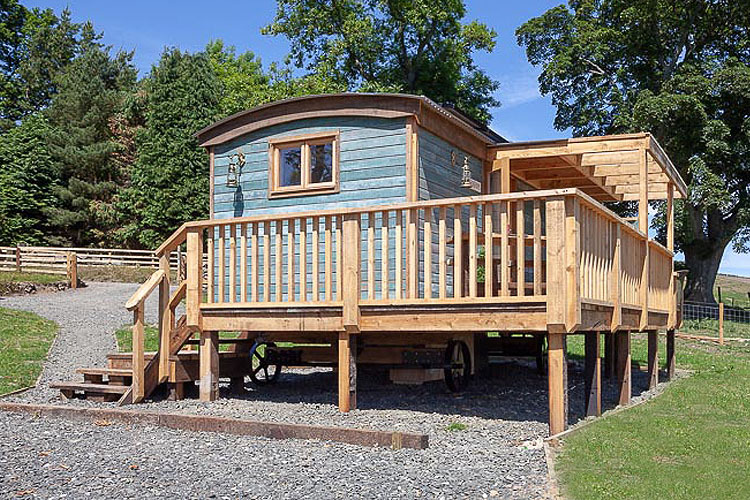 Made from solid reclaimed oak with hand forged wheels and sheeps wool insulation these huts take you back to nature. The huts themselves have a high quality rustic feel teamed with beautiful interior fittings. 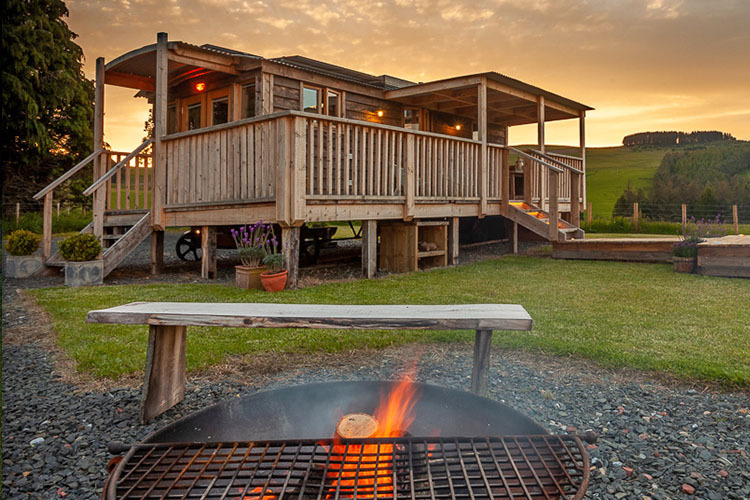 Set in their own secluded area with spectacular views to enjoy, car parking next to your hut and an outdoor fire pit for alfresco dining. If you'd like to discover more about the story of how the huts came to be in the hills, please take a look at our blog. On arrival at Hedgehope I was blown away by its location and the spectacular panoramic views. The hut itself is beautifully finished and every attention to detail has been made to make your stay the absolute best. Nicola made us feel so welcome and her home cooked food was really delicious. The highlight of our stay was sitting in the bath on the outdoor decking area with a glass of bubbly watching the night sky. Overall, the experience was one I shall never forget and I highly recommend it. You don’t know what you’re missing til you’ve been! So much thought gone into everything. Very comfy king size bed, with lovely cotton sheets. Super hot water in a spacious shower room. Proper toilet! Amazing bath with spectacular view on the veranda! Beautiful interiors, so much thought and little touches. Breakfast left in the fridge for us...delicious. I can’t praise Huts in the Hills enough. Thank you for a lovely stay. The Cheviots are oft overlooked, but are basically the British Cairngorms; rolling hills, sun kissed heather and heart-breakingly sublime views. The sort of thing Jerusalem was written about. You get it 1hr from Newcastle and all the cosmopolitan vices that provides. There are decent towns half an hour away and lovely pubs dotted all over the shop. The point being you get total isolation without being isolated; it’s easy to get to, but once there you could be a million miles away. Like many rural locations, the people have a unique, stoic gruffness that belies an immensely accommodating nature. The hosts are the very epitome of this and their hospitality knows no bounds. They are also more than happy to let you get on with it! The hut itself was - without doubt - utterly gorgeous. The attention to detail was staggering and utilities such as hot water, taps etc were worked into the rough, recycled wood decor with sumptuous care. We enjoyed our complimentary cake (homemade and DELICIOUS) in the outdoor bath, with a glass of wine overlooking the valley, in total seclusion and peace. In summation. It cannot be rated highly enough. I’ve not bothered with the basics; it was obviously clean and everything worked etc... The overall experience sets it apart from anything else and they are truly in a class of their own. Absolutely amazing place and extremely friendly owners! If you are thinking of staying in Northumberland, this is where you need to be. Can’t wait to visit again, we had already started planning our next visit the minute we’d arrived. A massive thank you for having us & all the wonderful effort you have put into this gorgeous place. Just got back home from a fantastic 2 night stay at Huts in the Hills. We stayed in Hedgehope which is the "middle" hut with the outside bath. Every bit of the stay was amazing, from the cosyness of the hut, the great attention to detail, fantastic breakfast and food provided (we should of had dinner provided on the 2nd night instead of eating out!). The views are breath taking, and we were lucky enough to have both nights with clear skies and neither of us had seen so many stars in the UK at night, absolutely beautiful. We couldn't recommend staying here enough and will to everyone we know if they need a relaxing stay away. We'll definitely be back, but we'll save it for another special treat.